LabelLogic is Planglow's market-leading software for overprinting labels, menus and ticketing. It is a simple but effective program that enables you to label your products quickly, professionally, and efficiently whilst complying with food labelling legislation. You'll receive a copy of LabelLogic free on loan* - plus full software training and ongoing technical support. To use LabelLogic, simply select one of our attractive looking stock label designs, or your own custom designed template. Then choose the layout, font(s) and style - plus any other information you require such as barcodes, RIs, logo or marketing message - and print using a standard desktop printer. 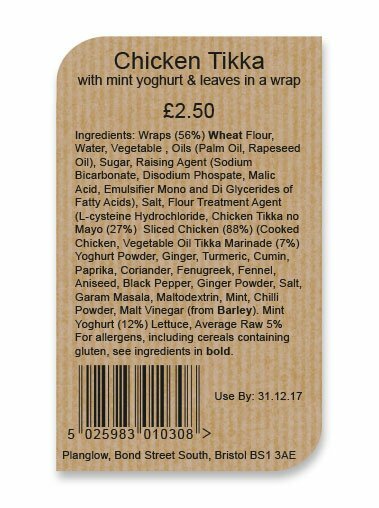 LabelLogic is fully compliant with the Food Information Regulation (FIR) which states, by law, that your customers must now be made aware of 14 potential allergens - most commonly on-pack. *An initial minimum order of one box of Planglow labels is required. Download your very own LabelLogic user guide here. Watch LabelLogic tutorial videos here.